The Driver Guide came as a result of extensive work of professionals from YASA International for around two years. This guide aims at facilitating the search as well as combining ideas with images and illustrations for clarification. It also puts the reader in the place of the driver to learn the different scenarios of different road situations. The theoretical part is expected to be accompanied with a number of driving sessions that highlight different situations. All this is in order to prepare the driver for better driving skills as well as help the driver avoid surprises that can cause tragic crashes with unknown results. The guide has several chapters which address the theoretical aspects of driver education. These chapters also address the behavior of the driver and the pedestrian as well as provide important recommendations for handling problems that the driver might face on the roads which increase the risk of crashes. 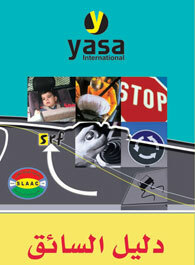 Along with this Driver Guide, and in an aim to driving skills, YASA International has also published other books as well as documentaries, brochures and posters all to help the different road users reduce the risk on their lives. All this alone is not enough; there is a big responsibility on the driver to learn proper road behavior to help achieve safer roads and decrease injuries and deaths. Therefore for the driver to acquire proper and efficient driving skills that empower him/ her to avoid preventable injuries, it is recommended to receive driver education through professional driving schools. This guide has been adopted by the Lebanese army and the ISF as a curriculum for their drivers.